Selecting a favorite pattern from the gorgeous projects in our magazines is like asking a parent to pick their favorite child: we all have one, but we can’t say it out loud. That’s why I love the Pattern of the Week posts, as I get to do just that. From this remarkable trove of patterns I get to make selections. It’s a tough task, but it means I get to drool over patterns at work (which is always a preferred activity). I only recommend projects I personally want to make, avoiding patterns I like to look at but won’t try to tackle at my current skill level. The goal being that hopefully you will want to knit the patterns with me! 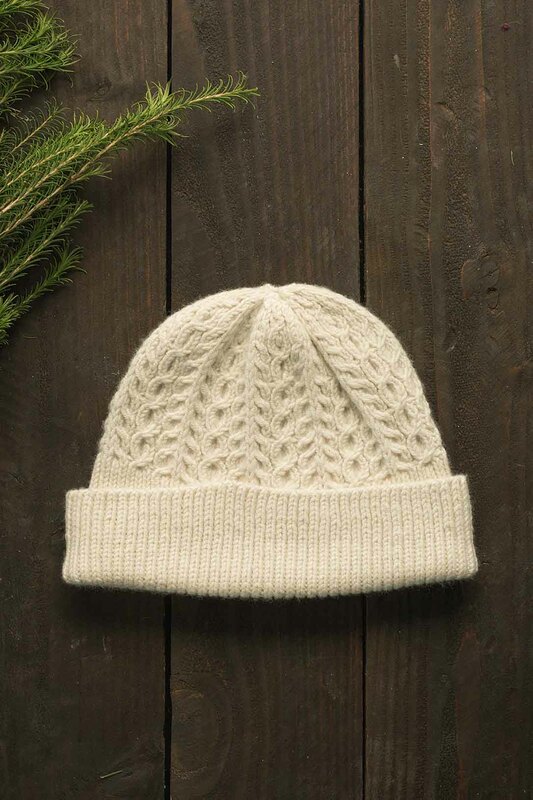 This week’s project, the Wayworn Cap by Meghan Huber, is from Interweave Knits Holiday 2017 and features one of my favorite yarns, Woolfolk. The name Wayworn, meaning weary with traveling, makes this pattern a great selection for my upcoming trip to Italy. 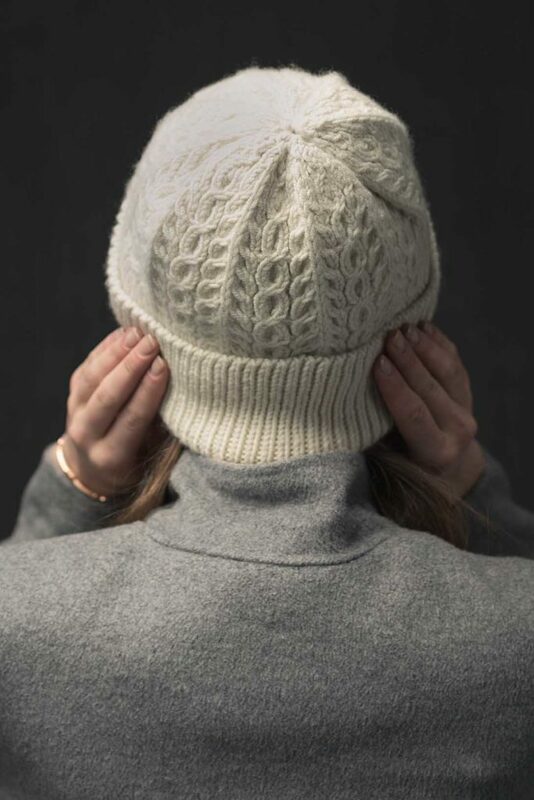 This hat is everything I need in a travel knit because it knits up fast in Aran-weight Woolfolk, a yarn that lives for stitch definition and feels like cashmere but without the high price point. 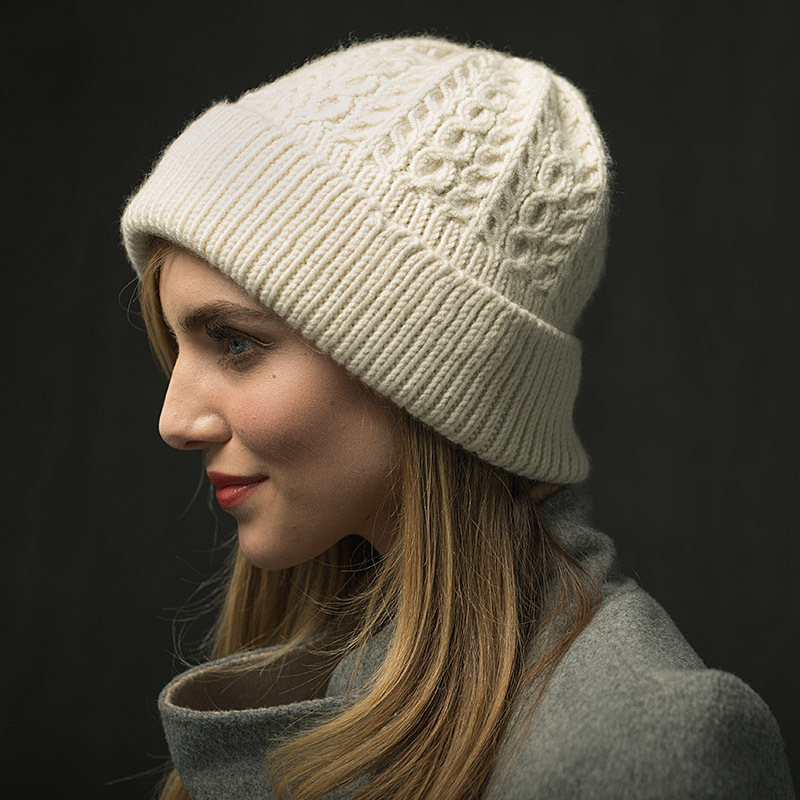 You work the hat in the round from the bottom up, starting with the ribbing and ending in a gorgeous cable pattern. 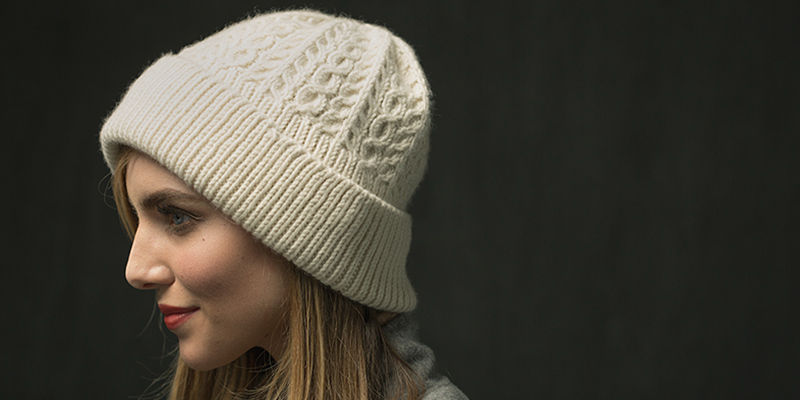 The ribbing looks warm and cozy, and the “coin” cable motif adds an oh-so-unique quality and knitting intrigue. I can’t wait to knit this on the long flights to and from Europe. The yarn, Woolfolk Tov, is very special. The base is Woolfolk’s exclusive Ovis 21 Ultimate Merino® that’s spun into a 12-ply Aran-weight yarn. It comes in stunning raw and earthy colors so you’re sure to find the perfect color for your project. 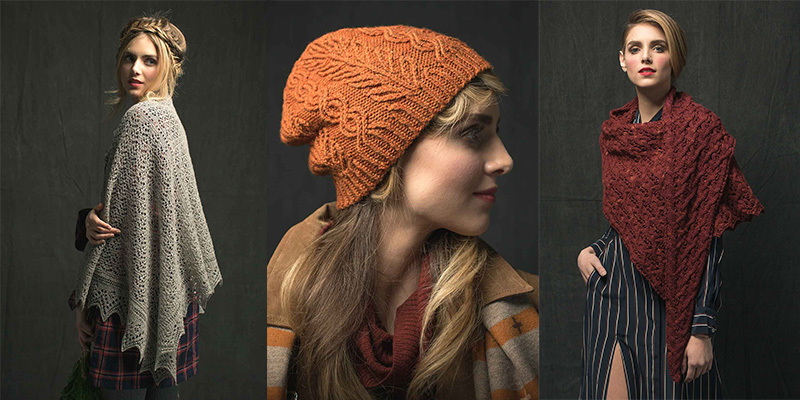 I love this pattern, but there are plenty of other incredible projects in this year’s Holiday issue, from quick knits for gifts to exquisite projects you won’t be able to part with. You’ll definitely want to check it out. Finished Size 18.5 (20.75, 22.75)” circumference and 8.5″ high with brim folded. 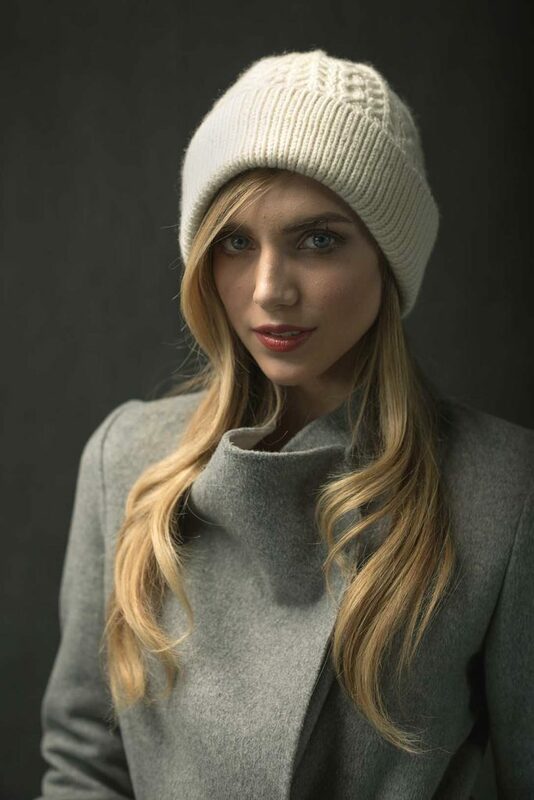 Hat shown measures 20.75″. Yarn Woolfolk Tov (100% merino wool; 173 yd [158 m]/3.5 oz [100 g]): #T00 raw (white), 2 skeins. Needles Sizes 3 (3.25 mm) and 4 (3.5 mm): 16″ circular (cir). Size 4 (3.5 mm): set of double-pointed (dpn). Adjust needle size if necessary to obtain the correct gauge. Gauge 31 sts and 32 rnds = 4″ in cable patt on larger needle. Notes This hat is worked in the round from the bottom up. 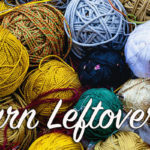 Want more great gift knits? Check out these patterns!